Welcome to Inchmarlo Golf Club – a true golfing treasure in the heart of Royal Deeside set amidst the foothills of the Scottish Highlands. Here you will find a warm reception and a full range of golf experiences to inspire eager novices and challenge experienced pros. As a 4 star resort, Inchmarlo Golf Club not only offers two stunning golf courses (the Laird’s and the Queen’s), a prestigious 30-bay driving range and fully-stocked pro shop, it also caters for discerning palates with a comfortable function suite, friendly bars and Gillies Restaurant providing some of finest hospitality in northeast Scotland. Just a 30-minute drive west of Aberdeen, Inchmarlo Golf Club is perfectly positioned in the enchanting Dee Valley and offers one of the finest golfing breaks in Scotland. Castles, hill forts and stone circles surround the golfing centre, while eagles and buzzards soar above creating a breath-taking backdrop and idyllic location to relax and play golf. 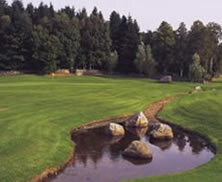 Inchmarlo Queens is not yet in our pool of Golf Courses for orders.